RNN Results in 2016: School News Network; How the Reading Now Network (RNN) (PDF) started in 2013. The RNN identified five schools to study based on a graph similar to the one above. Research has been well documented showing the correlation between socio-economic status and achievement, especially in reading. The graph on the left shows all the schools in West Michigan (MAISA Region 3) that participated in the State Reading Test (MEAP) from 2011/12 to 2013/14, each dot represents one school. 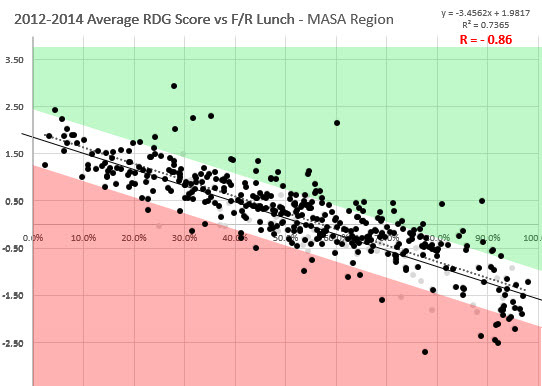 As poverty, based on Free/Reduced lunch, increases (from left to right), the data clearly shows achievement (average standardized scale score) drops rapids (as seen by the downward slope). The white ban with the "best fitting line" running in the middle represents this pattern where most schools fall. However, some schools are significantly above similar schools (in the green region) where other are significantly below (red region). Visit gomasa.org/readingnow for more in depth information on each of the five findings. Educators have heard the comparisons made with the NAEP and we know the challenges that occur with poverty. So STOP looking at data without the lens of poverty and STOP comparing to the state average ... learn how to look at data differently. The five findings may seem simple, however, the findings are really about the depth in which the high performing schools were focusing on reading and using relevant data ... learn more from the educators by watching the videos and reflecting with others. Coming in 2017/18 support around the GELN Literacy Essentials including online modules and a new website. "It takes a village to raise a child" - African proverb. Likewise, it will take an educational community to truly increase reading proficiency in Michigan. Become a part of the solution, break down the silos and seek to collaborate with other districts, community organizations and other stake holders.